Asynt announces the DrySyn UNO Base - a versatile entry-level reactor flask heating system with heat resistant handle making it the perfect way to conduct safe experiments in academic teaching and research labs. Designed and manufactured in the UK, the new DrySyn UNO Base provides a simple but effective tool for safe heating and clamping of a single flask or vial using a DrySyn Reaction Vial insert. 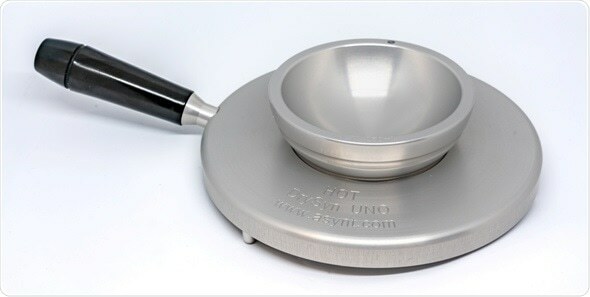 The DrySyn UNO Base has a flat bottom with removable/repositionable feet making it suitable for use on any standard magnetic hotplate stirrer. The robust solid anodized aluminum construction of the DrySyn range offers excellent performance without the need for messy and potentially hazardous oil baths.